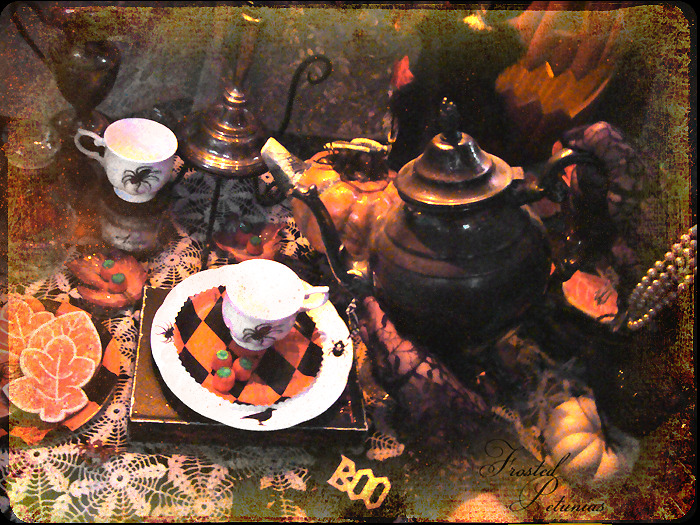 How To Throw A Perfect Halloween Tea Party! It’s not about being a scaredy cat but there’s just something about the atmosphere that is not right. Hear that? That rustling of the leaves, the sound of footsteps echoing as they get closer, the sudden gust of cold wind and some rather grimly carved pumpkins scattered around. It is clear that the outdoors are not a very safe place to be, with most people pulling pranks on strangers. 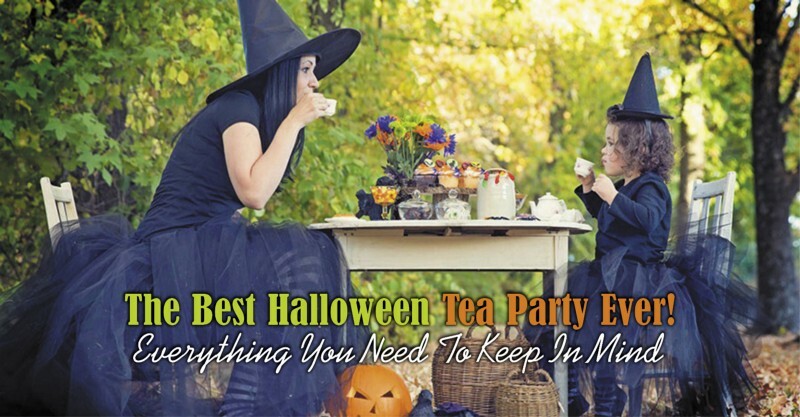 And that’s why, this is the perfect time to throw a little Halloween Tea Party! 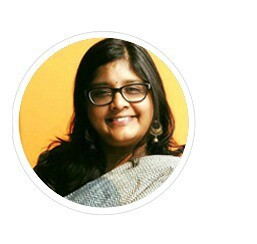 Don’t fret for we have got you covered for this one! All you need a spot in the sun that is close to the kitchen (for the refills). A table with 4–6 chairs, depending on how many friends you are inviting over and your carved pumpkins. Be brave! Get those little bat decorations out and sprinkled about in the garden to add to the mood while we help you set the table. Take the 2 tsp tea in a food processor to make a fine powder. Alternatively, you can use a mortar and pestle to grind tea leaves, or put tea leaves in a bag and crush them. Use the other 1 tbsp tea leaves to steep a strong tea. Once the tea has cooled, set aside 40 ml. Separate 3 eggs to whites and yolks. In a large bowl, whisk the 3 egg yolks while gently adding one-third of the sugar. Add the vegetable oil and tea to the mix and whisk it all until well blended. Now add the powdered tea to the mix. Sift the cake flour and the baking powder into the egg mixture in 3 increments. Keep whisking to avoid the formation of any lumps. Take out your stand mixer and pat it dry to avoid any water or oil residue. Pour in the egg whites and whip at medium speed for a few minutes. Now add half of the remaining sugar and keep mixing. After half a minute, increase the speed to high and add the sugar in small portions and watch the stiff peaks being formed. You can pull up the whisk to checking on the sturdiness of the peaks. Fold in 1/3 of the egg whites in the earlier batter until the mixture is homogeneous. Add the rest as you keep folding to ensure that the batter remains airy. 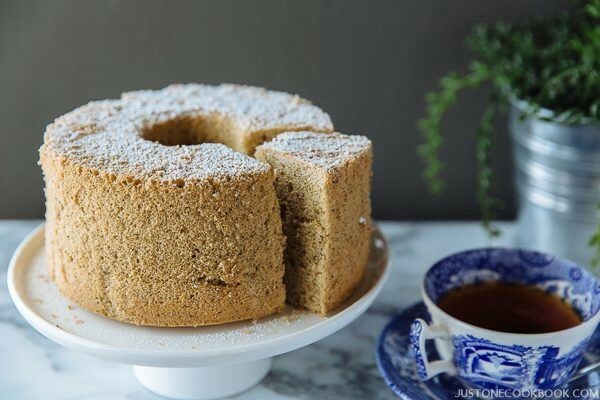 Take a 7-inch chiffon cake pan and pour the batter to it. Ensure there are no air pockets in the batter by gently tapping the pan. Bake for 30 minutes or until the top turns golden brown. Cool the cake upside down to ensure it does not collapse and then set out in a serving plate. Dust the top with icing sugar before you serve, if you wish. Preheat oven to 375 degrees Fahrenheit. Line a 12-cup standard muffin tin with paper liners; set aside. 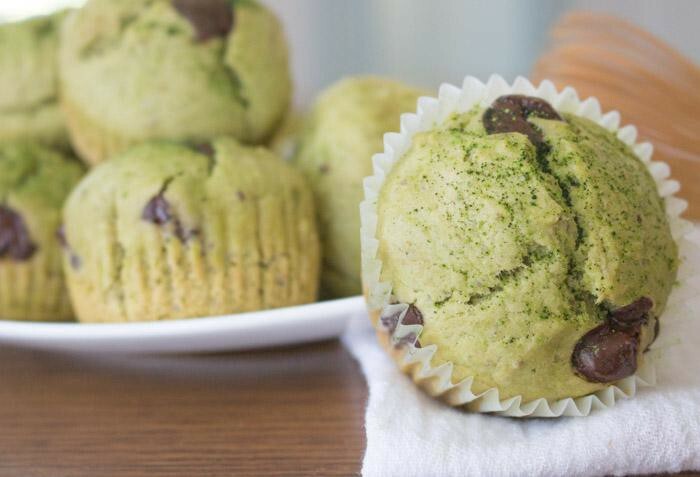 Take a small bowl, mix together flour, green tea powder, baking powder, salt and sugar. Add egg, milk and butter, stirring only enough to dampen the mix, not too smooth. Add blueberries and gently toss to combine. Add the batter evenly into the muffin tray and set to bake for 20 minutes. Check to see if the centre of the muffins is done before taking them out. Set aside to cool once done, and serve. Read the original recipe here. Now remember to greet your friends with a tall refreshing glass of iced tea before you settle in on the gossip. As the party progresses, serve a delicious array of teas while feasting on cakes and muffins and let loose those scary stories set aside for an evening just as perfect as this.